Just to start out with this disclaimer , this could be the most fattening thing I have ever made. Delicious but wow!!!! What the heck it’s dessert right? Dessert could and should be decadent or else you can have a piece of fruit. Well now that I made my disclaimer on to the good news. It’s quick, super-easy , pretty inexpensive and tastes pretty amazing. Just make certain that your ingredients are very cold and the lemonade comes directly out of the freezer. You can buy a prepared graham cracker crust if you don’t want to bother making one–I give you absolute permission to do so. Just make sure that the whole pie gets eaten because you don’t want this pie hanging out in your freezer–it can get dangerous. 12 ounce whipped topping, thawed–I guess you can go light with this but giving all the other ingredients you may as well go full throttle. Beat condensed milk with an electric mixer. Add Lemonade directly from freezer and beat until very thick. Fold in whipped topping with a spatula until just folded in. Remove from freezer 1/2 hour prior to serving. I placed some berries on top or you can use a piece of lemon or lime for decoration. 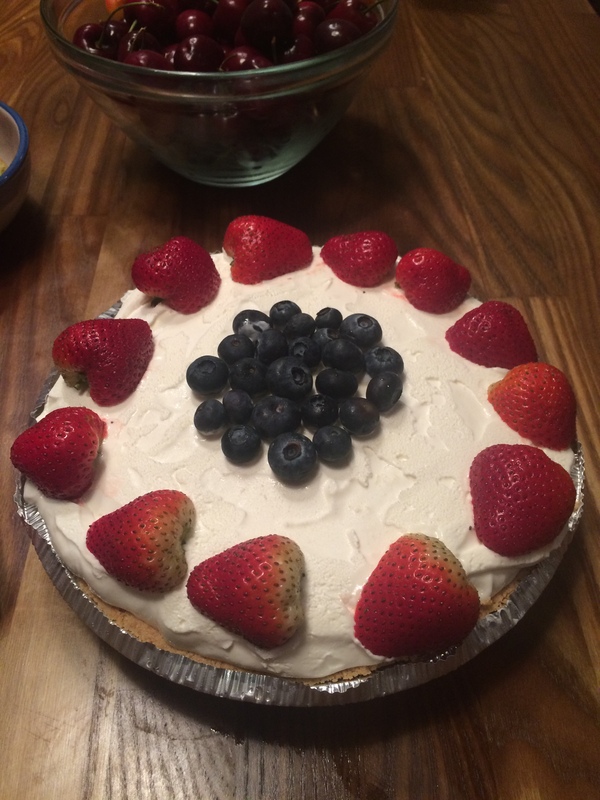 This entry was posted in dessert, Frozen Dessert and tagged easy frozen pie, frozen lemonade pie, lemonade frozen, lemonade pie, no bake pie. Bookmark the permalink. What kind of whipped topping? My mom used to make this with pink lemonade concentrate! I was thinking of it the other day, wishing I had the recipe. Now I do!